Sometimes to get it just right, you got to do it yourself. 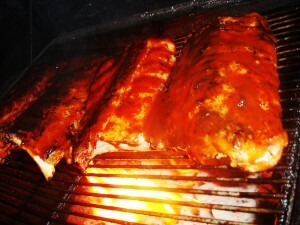 Behold 4 racks of baby back pork ribs sizzling away on the big pit. We were bidding a fond farewell to a couple friends who are removing themselves from the great state for the next 2 years and figured barbecue would be as good a way as any to send ’em off. Off photo: 12 lb brisket cooked for 10 hours, smoked boudin stuffed into wonton wrappers and deep fried, coleslaw, potato salad, red beans and rice and chocolate cake. Amid a few bottle of Real Ale and Rebel Yell. This entry was posted in Texas Barbecue, Texas Daily Photo and tagged Austin, barbecue, BBQ, best barbecue, Brisket, Pork Ribs, texas, Texas Daily Photo. Bookmark the permalink.